The Pit Bull Proud adoption program was created in 2014 to increase the number of Pit Bulls adopted into loving, forever homes. Pit Bull type dogs make up 45% of the homeless and neglected dogs brought into MADACC each year. In 2018, we revamped the program. Instead of subsidizing adoption fees, we will now provide our pit bulls with a welcome home kit to take home with them to their new family! 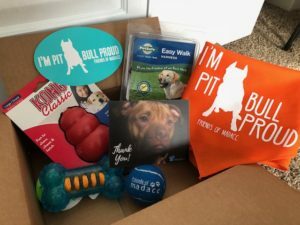 The kit includes an easy walk harness, toys, and our new Pit Bull Proud sticker and bandanna. In addition to this, we run an awareness campaign from June to October to showcase our pit bull pride and raise awareness for these dogs. This campaign culminates with our Annual Pit Bull Awareness Day towards the end of October. We want to give a special thank you to Pet Supplies Plus Greenfield for discounting items to help make this kit possible! Over 550 Pit Bulls have been adopted via the Pit Bull Proud Program since 2014. Join us every year for our Annual Pit Bull Awareness Day Celebration in October! Show your pit bull pride, support other pitties in need in the community, and of course bring your furbabies with! 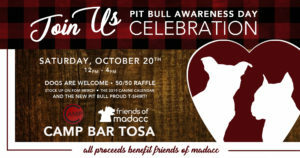 Attending our fundraising events and picking up your very own Pit Bull Proud apparel! Did you adopt a Pit Bull from MADACC? Send photos of your dog to us at friends@madacc.org and we’ll feature you and your pet on social media! 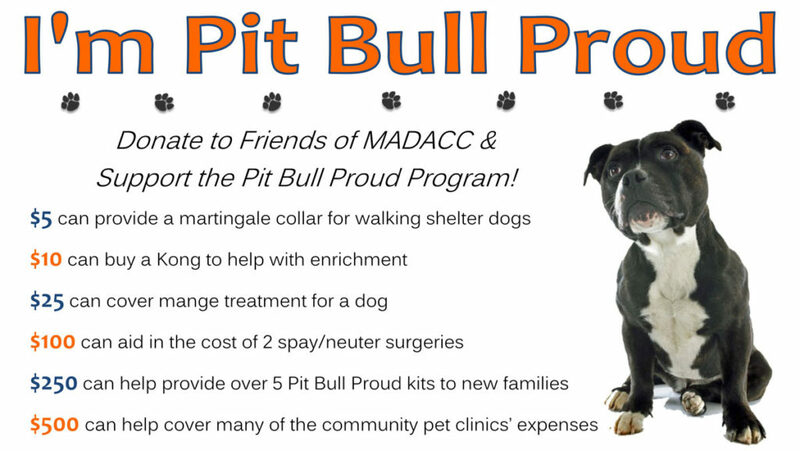 You can also post to our Facebook page or use #PitBullProud and #adoptmadacc on Instagram. Whether you are interested in volunteering with the animals at the MADACC shelter or with us for outreach events, fundraising events, or committees, visit our volunteer page to learn more about opportunities and get started today!